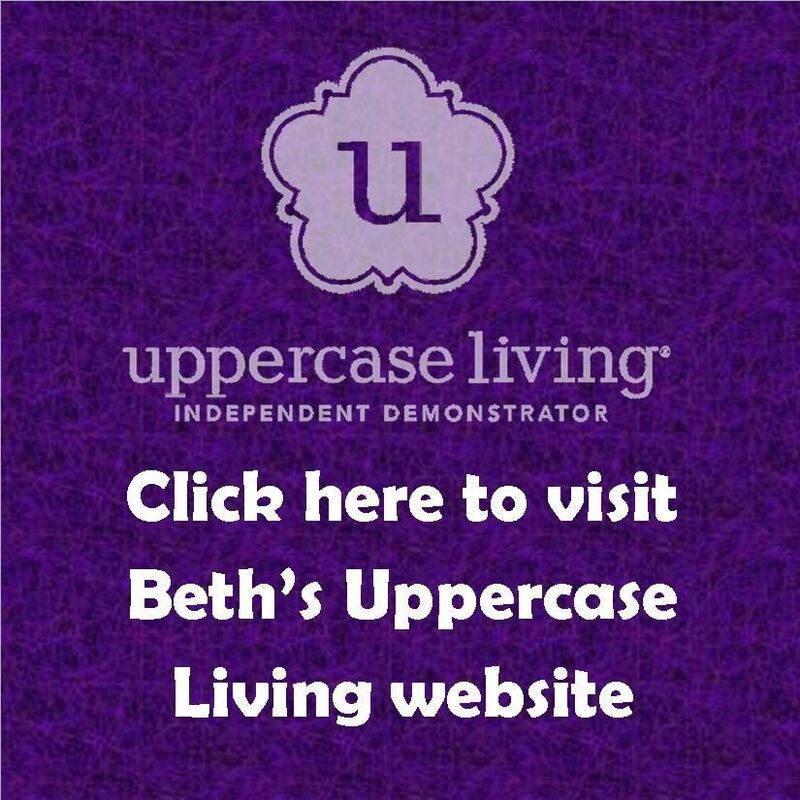 Then, I was invited by Uppercase Living to share my “why” with everyone. Here it is. If being part of something positive — something that uplifts and inspires others — is important to you, I invite you consider joining my team. Here’s a no-obligation FAQ and other info. Have questions? Want to learn more? Let’s chat. I love decorating for Halloween! 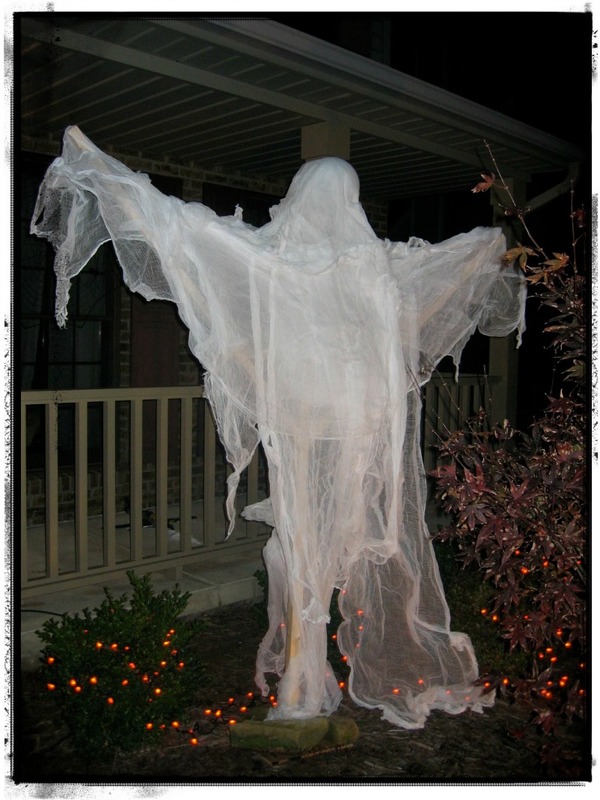 No, not the gory, creepy, make-you-scream type of decorating. 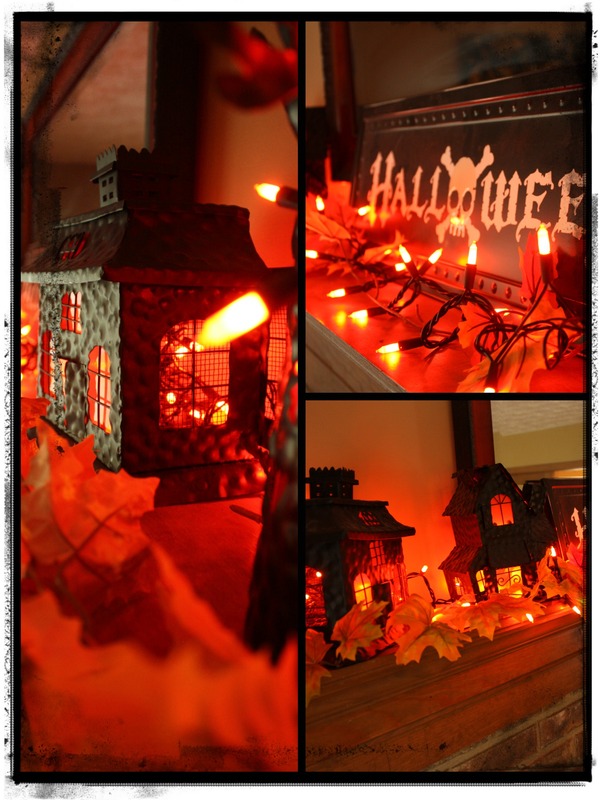 I love bringing in lots of orange and a little tiny bit of spooky. Today I watched my oldest son back the car out of the driveway and drive away. Now, granted, he was in a car marked “STUDENT DRIVER” and he arrived home safe and sound with his instructor (who had his own set of brakes in the passenger seat) two hours later, but still. It is a weird experience. I got so verklempt I had to retreat into the house so that he didn’t see me get a little weepy. But, I realize that’s how this whole thing works. Eventually they do fly (drive?) away from the nest. And that’s a good thing. So, please just bear with me while I get used to the whole idea. What is your family’s favorite recipe? What’s your go-to meal that is always a crowd pleaser? The comfort food in our home is Spicy Peanut Noodles. The recipe is embarrassingly easy. The hardest part is remembering to prepare it a few hours ahead of time so the flavors can meld. Spicy Peanut Noodles are served chilled or at room temperature, so it’s a smart choice for picnics or a buffet. Add leftover chicken and now it’s a main course. Here’s the recipe. 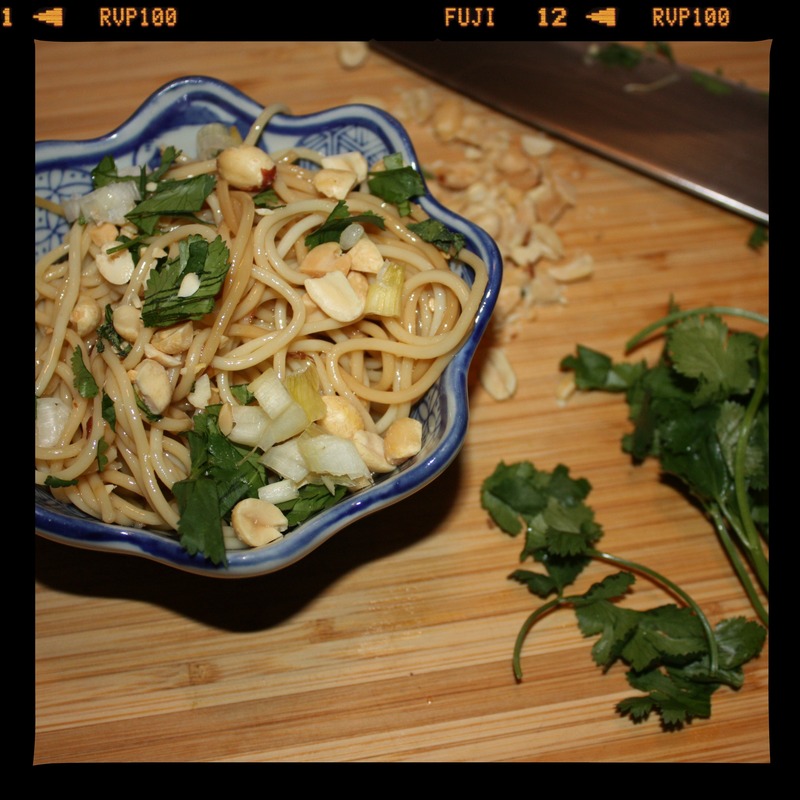 For the record, I don’t bother to measure the garnishes (cilantro, green onions, peanuts and sesame seeds). I have also made this with pretty much any type of spaghetti noodle (from angel hair up to regular thickness) and in quantities ranging from 8 oz. up to 16 oz. From my home to yours: bon appetit! In a small saucepan, heat oils and red pepper for two minutes over medium heat. Remove from heat and stir in honey and soy sauce. Combine noodles and oil mixture. Refrigerate for at least 4 hours or overnight. Garnish with last four ingredients and serve. My Dad is a very handy guy. 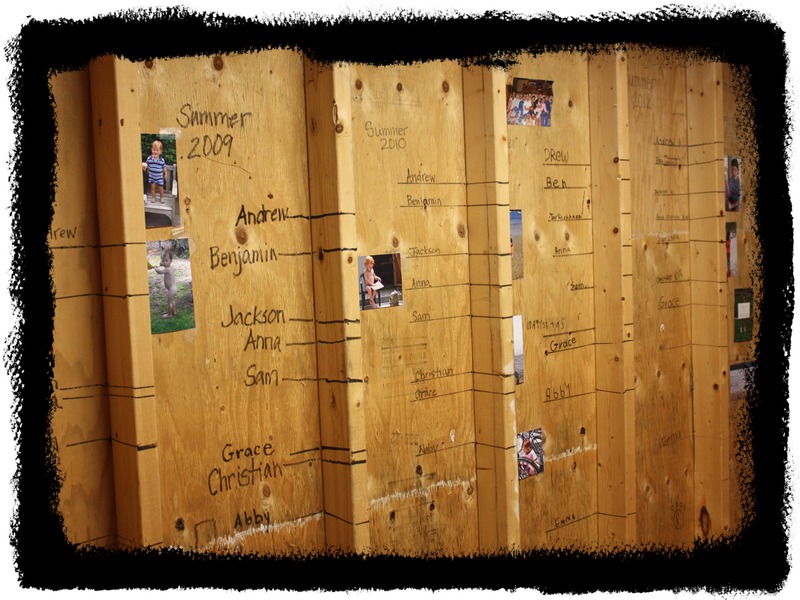 He can take an idea, sketch it out, then bring it to life with some power tools and several trips to Home Depot. 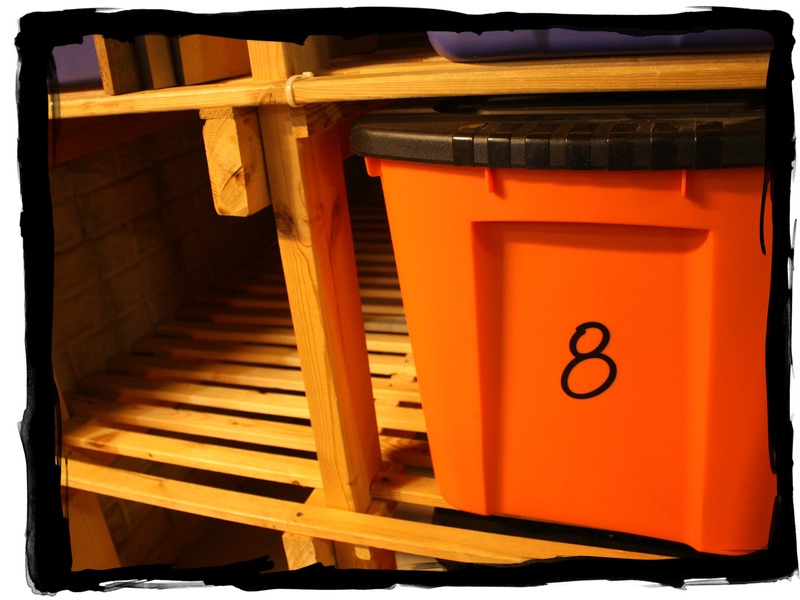 Eleven years ago (when my parents were visiting to spend time with their newest grandbaby), he transformed an area of our basement into the ultimate storage tote shelving unit. Suddenly, we had a place to store all of those “things” that we wanted to keep, but didn’t want sitting out all the time. Halloween decorations are, of course, in the orange and black bins. Christmas decorations are easy to spot in the red bins with green lids. As our boys grew, the storage rack (which is EXTREMELY sturdy) became a jungle gym. They would climb up to the top and then shimmy hand over hand across the I-beam on the ceiling. It also made an awesome fort; remove a few bins and add blankets, pillows and flashlights. Let’s talk about organization for a moment. 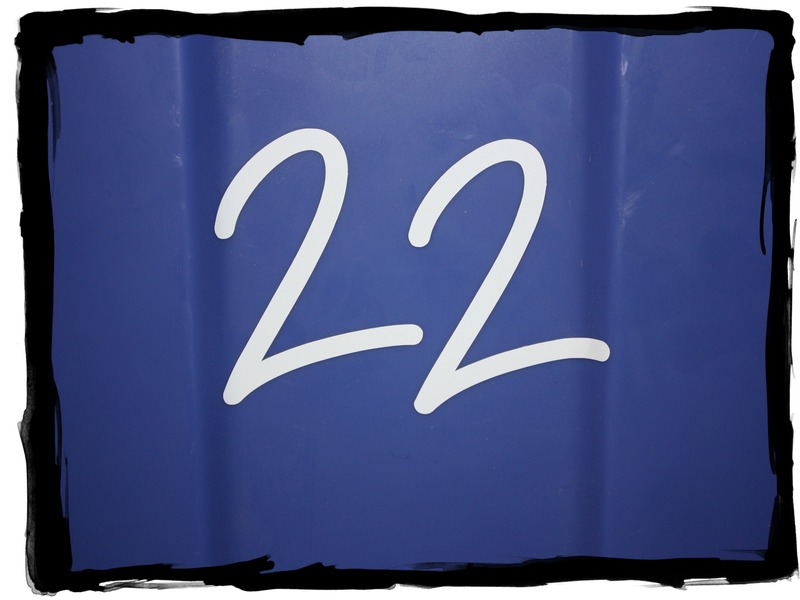 The outside of each bin is labeled with a number using Uppercase Living vinyl. Here’s where you can really take your basement “stuff” to a new level of organization. We created a spreadsheet where each bin number corresponds with an overall category (e.g., #5 = Halloween). Then, the contents of each bin are listed on the spreadsheet next to that bin’s number. (You can use index cards for this, too.) Need to find your white Christmas lights for a party you’re having in July? Refer to your chart to find the Christmas bins (yes, there are half a dozen!) then narrow your search to see which of those six bins has “lights” listed in their contents. Now you only have to dig through one bin, not 25. 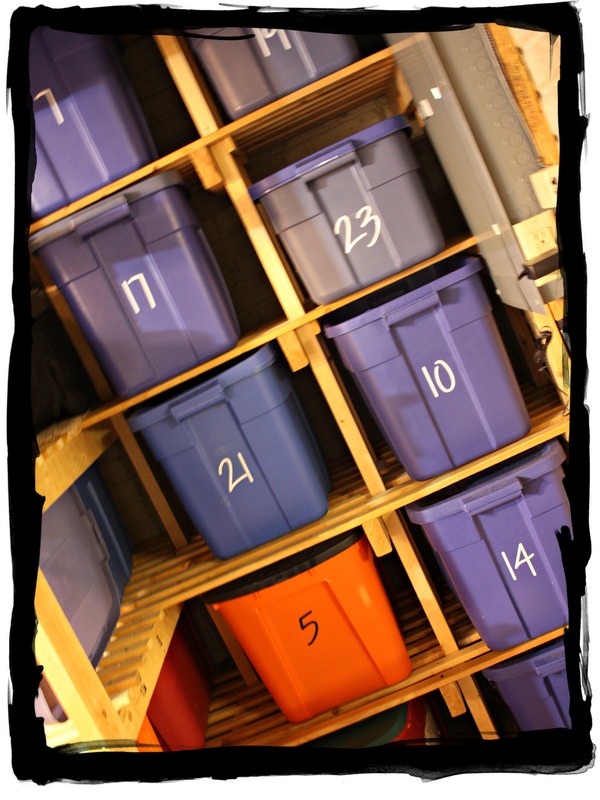 Do you use totes like the ones pictured here for storage? How do you keep them organized? 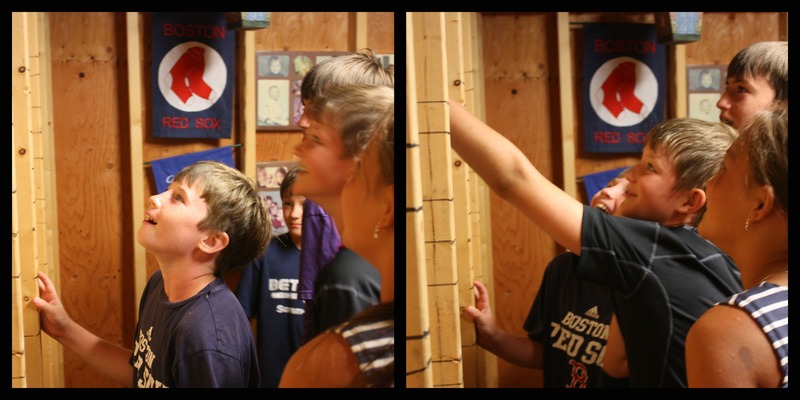 One of our favorite family traditions is the annual measuring-of-the-cousins (my boys and my siblings’ kids) when they are visiting their grandparents each summer. 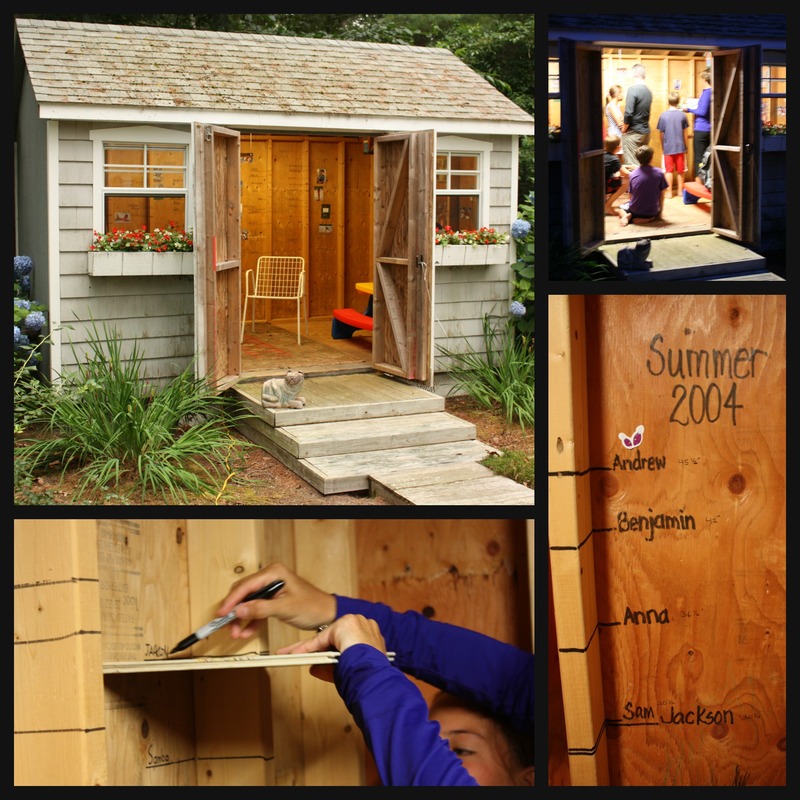 My parents, known as Nana & Papa to their nine grandchildren, have an adorable shed-turned-playhouse in their backyard. 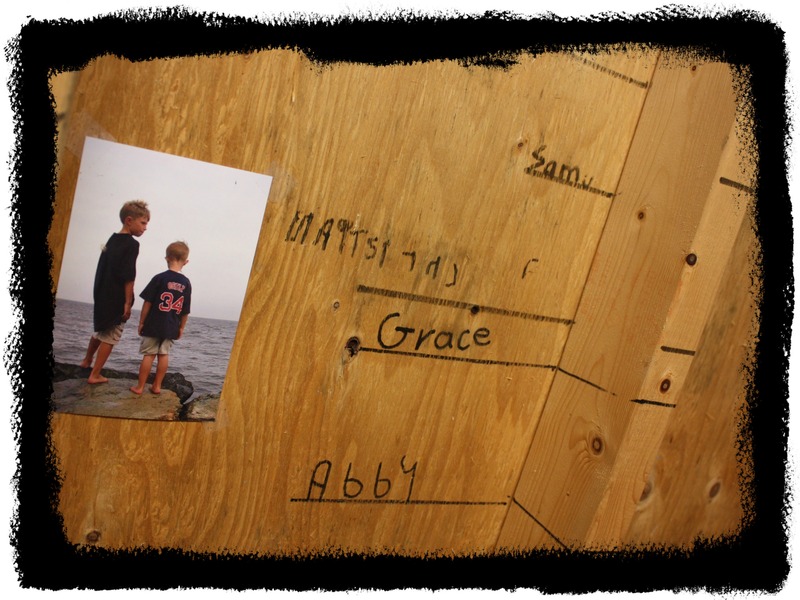 Nearly ten years ago (when there were only five grandkids), we took a Sharpie and marked the height of each child on the playhouse walls. Every year since, we’ve dedicated one summer evening to s’mores around the firepit and seeing how everyone measures up (against their last year’s height and against each other). You’ve probably never seen kids stand with such impeccable posture. Everyone has fun seeing the results! A few years back we started letting the kids write their own names, with some pretty hilarious results. 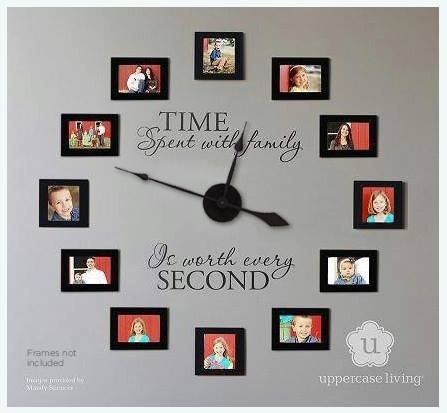 Each child is so unique in his or her growth rate, even among siblings. I am realizing, that when we measure up this coming summer, one — or two — of my boys will be taller than me. Yikes. How did that happen? 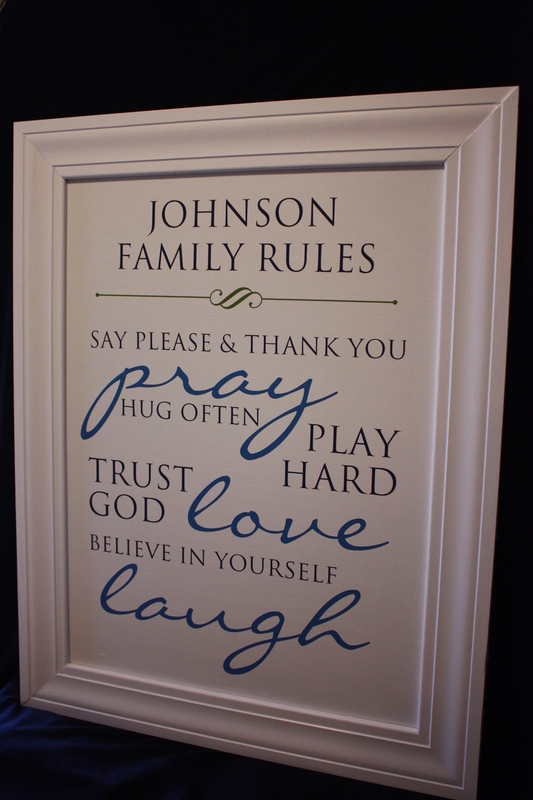 Have you seen the Family Rules signs on Pinterest? Here’s an example of one I helped a customer do with her own family’s rules. Love the way it turned out and I love the thought she put behind each rule: say please & thank you; pray; hug often; play hard; trust God; love; believe in yourself; laugh. Recently, I came across a post from a special needs resource blog that I follow to help me with my job in special needs ministry. The topic was how to create a therapeutic living room in your own home, and suggestions were given to create both a calming environment and a stimulating environment. The very first item on the list for establishing a comfortable, calming environment was to post your Family Rules. A sense of order is important and everyone needs to know that the entire family, even parents, live by the rules. …more like a wish list than actual family rules. Finally, the oldest said: “The Golden Rule” and his brothers chimed in, “Treat others the way you want to be treated.” I think that does sum up the Golik family’s rules quite nicely. 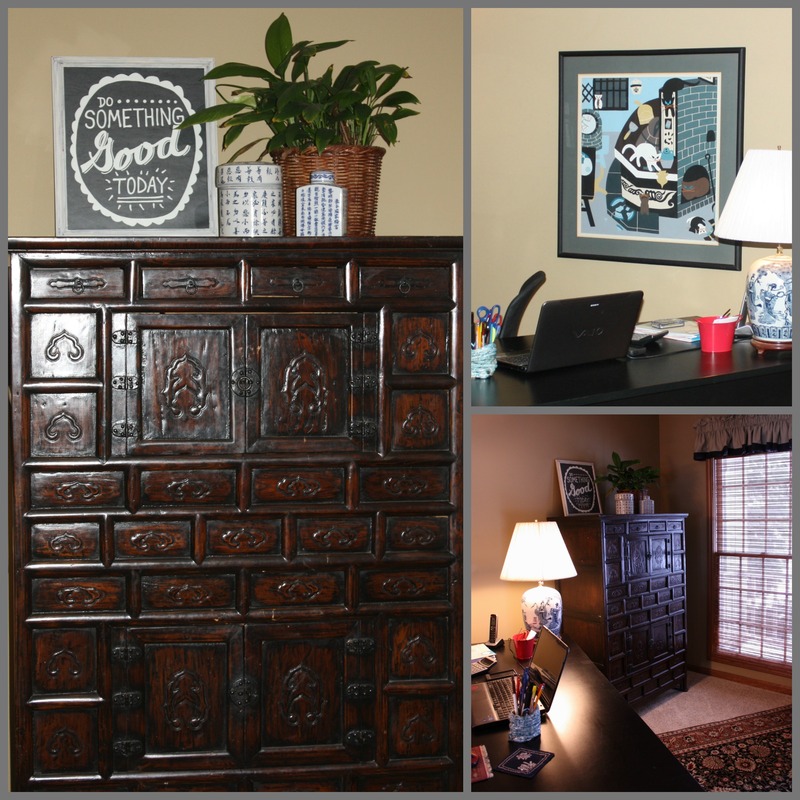 A few weeks ago, I blogged about my home office re-do. Started by purging everything — even furniture — from the room and rearranged and reorganized to create a more functional and less cluttered environment. 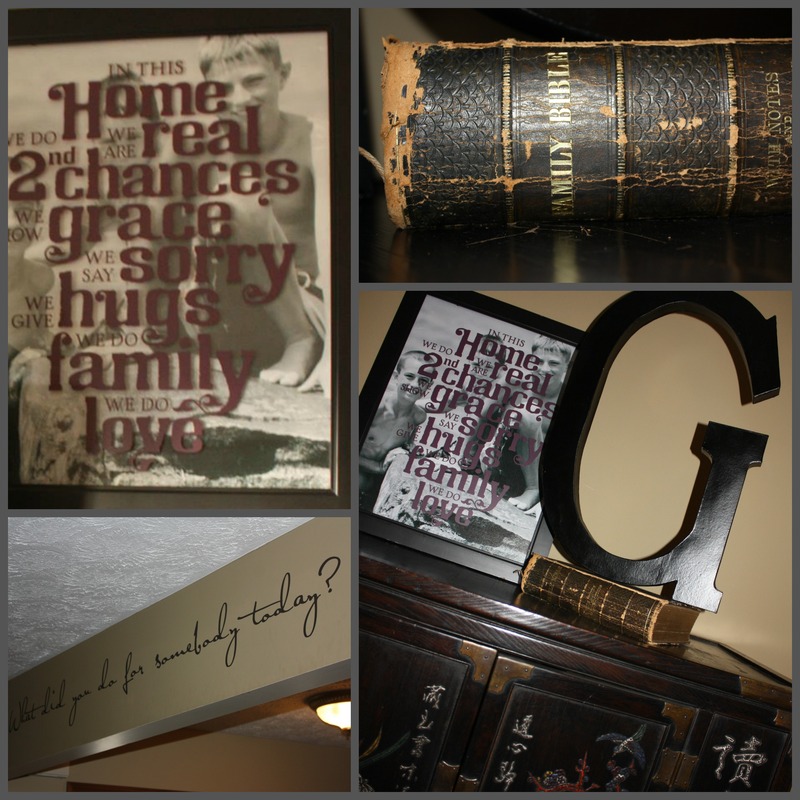 I’m finally ready to show you “the reveal”…a term you’ll know well if you are a fan of HGTV. One of the biggest changes was moving my desk (a large former drafting table) on an angle looking out the window. I now have a view of the outside world when sitting at my desk (which, these days, means I’m mostly looking at huge piles of snow). 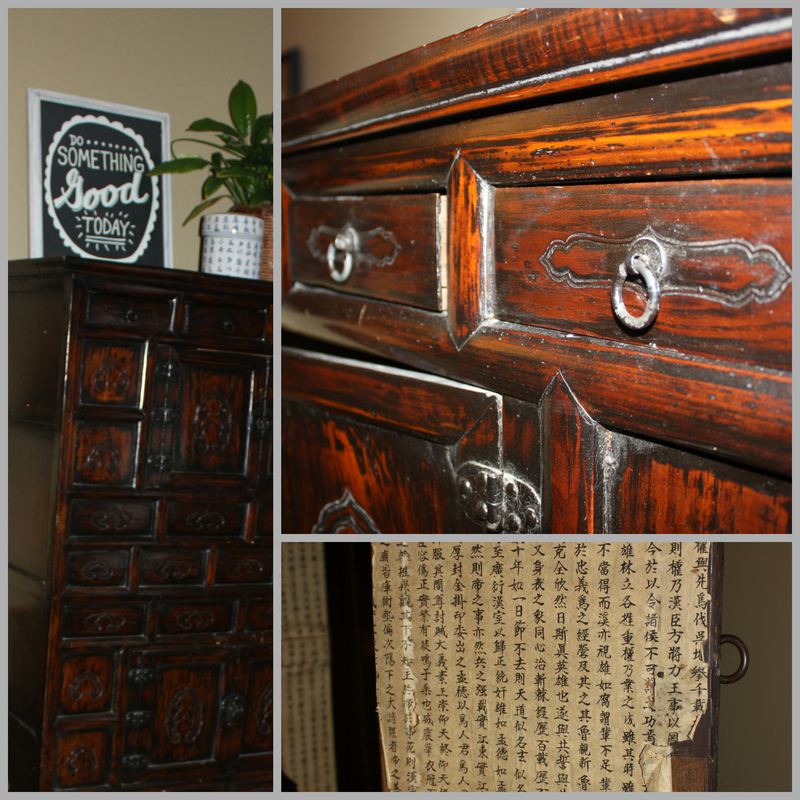 Several of my favorite Asian pieces were brought in including three chests and two peasant prints. (My family lived in Asia when I was a teenager and my parents, siblings and I each have a few of these colorful prints in our homes.) Propped atop one of the chests is a fun expression — Do Something Good Today — applied to a framed piece of chalk wall vinyl. The chests have lots of little drawers and cabinets, which are perfect for storing my Uppercase Living catalogs and sample words. Another favorite expression — In This Home — is featured on a framed black and white photo of my three boys. The Bible shown here is the Benjamin Family Bible that belonged to my great great grandmother in 1903. One of our sons is named Benjamin…and it turns out there is a whole branch of Benjamins (last name) in our family tree. There even used to be a village of Benjaminville in Illinois, where many of them are buried. When I look up from my computer, just to the right of the windows, is a custom expression that says: What did you do for somebody today? Is your workspace (or living space) a reflection of you? Do you have the words that are important to you right there where you can see them? Are you a New Year’s “resolutioner”? Or, instead, have you joined the #oneword365 crowd to come up with your One Word for 2014? Here’s the idea…choose just one word for the whole year. Forget the New Year’s resolutions and discover the impact that your one word can have on your actions and decisions. Use your one word as a compass to determine how you want to live or who you want to be. This idea intrigued me because, truth be told, I am terrible at New Year’s resolutions. Like most women my age, my life is cram-packed with family, work, and all kinds of activities, and that is exactly the way I like it. I enjoy the opportunity to wear several different hats (metaphorically speaking) and have snippets of every part of my life swirling around in my brain at any given moment. 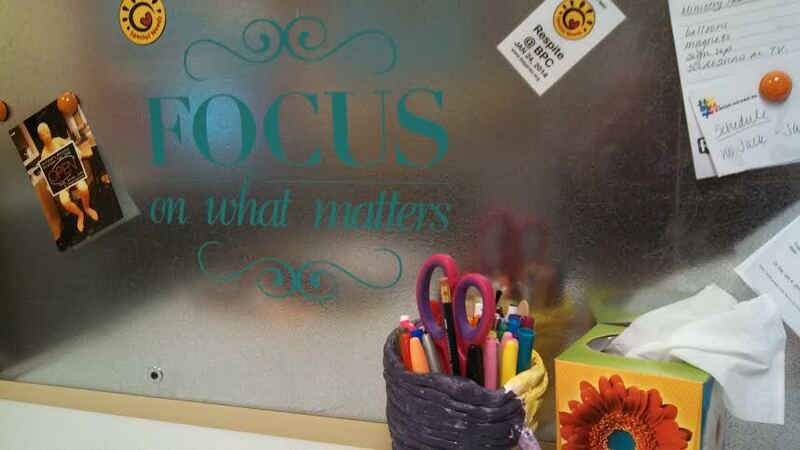 By focusing on FOCUS (oh the irony!) I am striving to be more present in every aspect of my life, whether it’s work-related or playing Ticket to Ride (our new favorite board game) with my sons.